Libby loves to explore, observe, and is a problem solver. 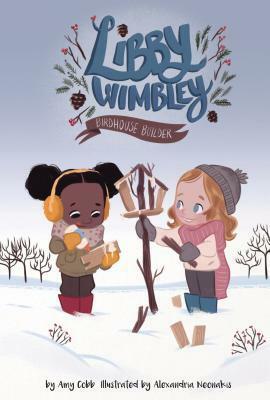 When she and her best friend, Becca, find out that there is a snow day–they are off for an adventure. Following a series of tracks, they come upon some bright red, and hungry, birds. Together Libby and Becca work through the design process to engineer a solution for their newfound friends. While not the complete design process is included, this story provide multiple opportunities for you to pause and/or engage your class in a discussion…or even some engineering themselves. The initial problem, hunger, isn’t completely solved in this story…their thinking partnership goes down another path, which is also demonstrates how often that happens and invites you and your class to identify problems to solve, either story connected or locally connected. You would think that nothing could be more exciting than a bike ride on a Sunday afternoon with your best friend–but Libby and Becca have just one task before pedaling down the dirt road…science homework. They need to be on the lookout for certain bugs in nature, and their experience tells them where to look. 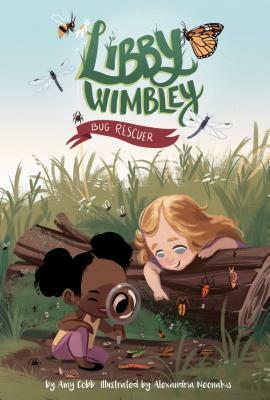 With just one more on their list, they come across a dragonfly in need of help, turning their role of bug detectives into bug rescuers! What bike ride? 🙂 While the needs of living things, in particular insects and their habitats, isn’t deeply discussed through the words, the pictures take the concept deeper and set you and your class up for a discussion and an exploration of their own. One of my favorite parts of the story is when they roll over a log, find a few of the insects on their list, but before they head off to find more, they roll the log back over, to help keep the insect home intact. How many of us head toward the animal shows and exhibits when you go to a county fair? I know I do and so does Libby and Becca. It is one of their favorite parts, especially the shows where they see all the extraordinary tricks the different animals can do. 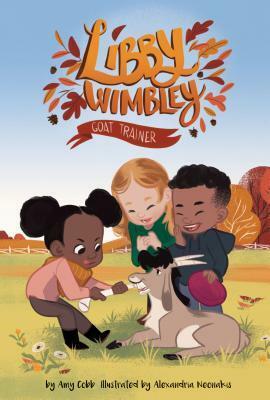 It gets Libby thinking of her own pet, Elvis the Goat, and the tricks she could teach him, with help from her friends. After trying all the tricks she saw at the show, and taking a much needed break, she realizes that Elvis’s trick is no trick at all. It is being himself and sharing that gift with others. What is his gift? You’ll have to read it to find out. 🙂 Early chapter readers will love and relate to the animal theme, and if read to the class, it offers a good example of trial and error, as well as following an idea through to impact, and help, others. 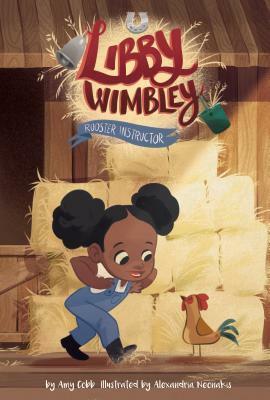 Also included in the Libby and Wimbley series is Rooster Instructor by I wasn’t able to read and review it. Kickoff the Year with an Interactive Bulletin Board! Now that I have my own classroom this year, running an inquiry lab, part-time, I wasn’t sure I was going to continue creating interactive boards. I wanted the bulletin board space I had to be focused on student work…well, that was until someone changed my mind. While attending a colleague’s wedding, I sat among my other colleagues and the topic of my boards came up. A 5th grade teacher shared that she was excited that I was now in a more central location (middle of the building, next to specials like computer and library). She shared that where I had the board before (across from my office in the 2nd grade hallway, next to the workroom), her students didn’t often get to see and participate in it and she thought it was such a great idea and opportunity. Other teachers nodded in agreement and added their own specific compliments. I didn’t share my thoughts on not continuing, just thanked them, smiled, and had the comments linger. Maybe there was a way to share the board and continue. So I did, and I am kicking it off with the #GoalSetter board for students, teachers, and parents to contribute. Our Open House is next Tuesday, and I can’t wait to see what new goals are added that night and the first days of school. Story is a great way toward incorporating STEM into your classroom! Fictional Stories, Historical Stories, Science Phenomena Stories, News Stories, Your Story, Your Students’ Stories, etc.! 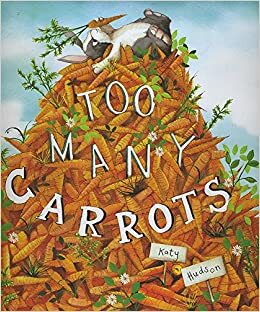 To illustrate this point we used the book, Too Many Carrots by Katy Hudson, but we didn’t use it in the traditional way. We didn’t read the whole story, we stopped as soon as we came to the main character’s problem (around page 4). Rabbit had too many carrots, that he didn’t have a place to sleep. We paused the story there and asked the teachers’…What are some possible solutions to Rabbit’s problem? We did this by providing them some independent think time (with drawing paper), followed by some table sharing and listening. But…we added an extension to this collaborative session and some constraints. Each group was also asked to construct their model, using a bag of $1 store materials + some blocks-like materials, AND to do so while making sure their model included some key components: Rabbit, 100 carrots (cut orange pipe cleaners), and 1/4-1/2 piece of construction paper to represent Rabbit’s available area. Note: This component makes this idea easy to modify based on grade level needs. Additionally, each group was given an iPad to document PROGRESS and to later select a platform/app to help them communicate their process to solution. Here are some of the creations! Quincey and I were WOWED by their solutions and how they communicated those solutions. So many ideas we never would have thought of alone! We learned so much from their models, and their selected platform/app. Many groups selected Popplet, which we have used before, but never to communicate process. It was an Aha! moment for us. 🙂 After the gallery walk I read the rest of the story so they can hear another solution, Rabbit’s solution, which was actually several attempts at finding a solution with the help of his friends. There were many faces of delight, surprise, and a new type of self-to-text connection, since they were able to journey with Rabbit and be part of the problem solving team. Afterwards, we gave them some more independent think time to jot down possible extensions, new ideas, connections, etc., which they shared whole group. We wrapped up the session by challenging them to think of their own STEM prompt by providing groups 3-4 picture books (ones I have featured on this site), along with Newela articles and stories found in their grade level reader. They shared these group generated STEM Story Prompts to the whole group, table by table. Our presentation was a blast and really conveyed our goal: Story is a great way toward incorporating STEM into your classroom! Fictional Stories, Historical Stories, Science Phenomena Stories, News Stories, Your Story, Your Students’ Stories, etc.! The books I provided the tables came from ones I received from a grant. You can access many of those titles HERE and HERE. You can also access them on my “Science Topic Book List” tab. The inspiration of this story pausing idea came from research from Tufts Center for Engineering Education and Outreach, which I have featured on my website. You can access that research and post HERE. The handout we provided teachers that reviews our key features can be found HERE. What do you plan on reading the first day of school? This is why I am going to once again return to Rhoda’s Rock Hunt for my K-3 grade levels! Not only does Jennifer A. Bell do a tremendous job of capturing story and emotions with her beautiful illustrations, Molly Beth Griffin weaves together a relatable story of a young girl, Rhoda, and her captivation with rocks. I, too, like Rhoda, love rocks, and I can share that text-to-self connection with my new students and use it as a prompt to learn about their collections, if any, or what captivates them in nature, or just what captivates them in general. 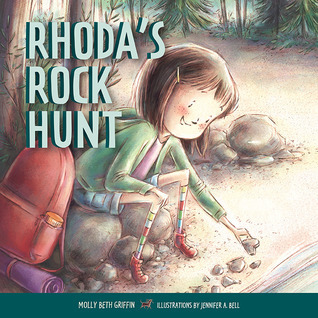 Note: Back in 2016, Rhoda’s Rock Hunt was one of my Featured Books! You can access what I wrote about it HERE. Also, if you want to check out some other potential first day reads, then checkout this post by We Are Teachers, 18 Perfect Picture Books for the First Weeks of School, written by Elizabeth Mulvahill. I came across this “Baby Loves” series from a Pinterest feed one day and was eager to check them out. I love seeing science concepts in board books, because it is never too early (or late) to build a healthy science identity—an identity already in each of us, but sometimes circumstances hinder us from seeing it. 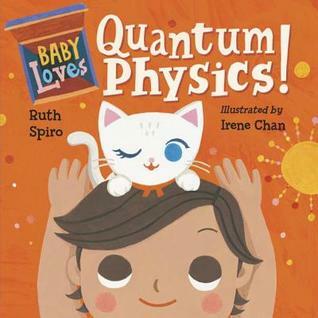 Baby Loves Quantum Physics! 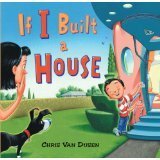 : I loved this approach to quantum physics for both the child and the parent. It leads to questions and application to other examples all around us. This was evident even within myself, since the simple text and illustrations got me asking questions, since my knowledge of quantum physics isn’t too strong. So I went searching…and found sites that made me want to return to the cat example. 🙂 I did find Forbes’ Six Things Everyone Should Know About Quantum Physics by Chad Orzel helpful in the way that it provides detail to go deeper, question more, and yet organized in a way that I was able to get an overview, but it did make me wonder about this cat example. Perhaps there are those reading this that think that I should already know about Schrodinger’s famous feline…but I don’t, or rather didn’t. If you were like me and want to know a bit more about this famous feline, here are two sites I looked into: National Geographics’ The Physics Behind Schrodinger’s Cat Paradox by Melody Kramer and Chad Orzel’s TED-Ed video on YouTube, Schrodinger’s Cat: A Thought Experiment in Quantum Mechanics. 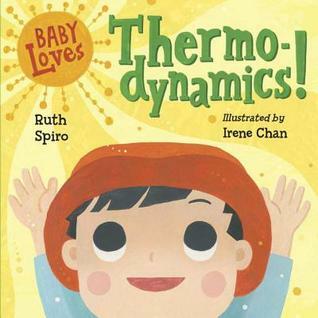 Baby Loves Thermodynamics! : Ok, so probably my favorite page is the spread that shows how the sun gives the apple tree energy to grow, and the visuals demonstrate the change over time in both the tree and the baby…followed by the energy given when the baby eats the apple. 🙂 Thermodynamics is a branch of physical science that focuses on these energy relationships, where the sun is just one form of heat and energy. Like the note on the back of the book says, “Baby loves thermodynamics because baby loves energy!” As a side note, I love how this simple book brought me back to a whiteboard conversation with my fellow science teachers as we, together, tried to diagram and explain “heat rises” when given a real-world house prompt. 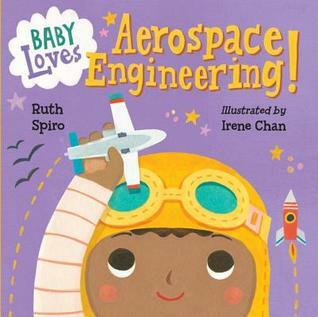 Baby Loves Aerospace Engineering! : As do I! 🙂 I feel like this book could also be called Baby Loves Observation or Baby Loves Questions, or something similar…like curiosity or learning how things work (I could go on). 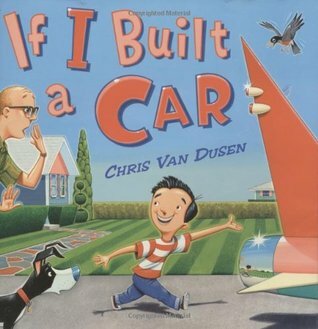 This simple text does a great job of connecting all of those science processes as it relates to engineering, and has the potential to take both child and parent on an observation and engineering journey at home. Great job Ruth Spiro and Irene Chan! I am going to be adding these to my list of great gifts for new parents! The ability to dream, to see possibility, and to follow both…we don’t all have that in us, even the young. Sure, we started that way, but in some cases it has been crushed down and out of too many. Let us, create safe and supportive classroom spaces that help dreams and imagination soar. With rhyming text follow a family of four (plus their little dog) on a family night indoors…well, until the lights go out and they head outside under the natural light of a full moon. Under this bright night sky, and with the bright layers of snow beneath them, they embrace the fun…”Down the hill, winter thrill”. The season starts to change, and you can see the signs…the sudden cold, the ducks in the sky, the “leaves shattering under your feet like glass”, and the pond icing over. Winter is here and for this community that means ice hockey, they just need to wait for the moon. Tracking the phases of the moon they wait until the moon is full and ready for the game. With moonlit, cold, and images full of action, they play. These two stories would be a great company to “Owl Moon” and other stories to support a phases of the moon unit, because we all have moonlit stories. Seeking out those narratives within your students, and combining them with a scientific investigation connects their memories, their heart and mind, to the science.